Wow! I can't count the number of times I've wondered how Adam and Eve felt after they ate of the forbidden tree. Tosca Lee takes on the challenge of what life might have been like in those post-Eden days and the awful turmoil in their hearts. Her attention to detail shines as she covers every facet of daily life. 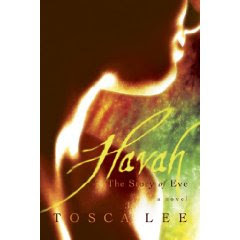 In a perfect marriage of story and craft, Tosca expresses Havah's bitter regret laced with a thread of hope for the future. The downward progression of the human race is set in juxtaposition to the former life in the Garden. With the exception of the Bible, I almost never re-read a book. Sections of this book draw me back even as I write this review. If you love romance, drama, and tension, Havah provides them all. I've heard only good things about this book. It's definitely on my list of books to read! I'm like you, I almost never reread a book. THis one must be pretty good for you to do it! One thing I found fascinating was the downward progression of the human race. I've often thought of how awful it must have been to know perfection and then lose it all. For me, the underlying themes made the book so powerful. I think you'd find it not only a good story, but thought provoking. I really want to read some her books. I've heard a lot about her. Good to know about this story. I wasn't sure I'd like it because for some reason I get bored when I read books that are about a real person. This must be pretty good. Even though the story is about a real person, many of the scenes are fictional. We have no way of knowing all the details of Adam and Eve's life in the Garden or after the fall. When we get to heaven, it will be interesting to see how close the real story matched the one she wrote. I heard about this book several months back and since then have only heard good things. It sounds so intriguing so...though provoking. I'm definitely going to put it on my list. Oh, I forgot. There's plenty of romance to satisfy lovers of that genre. This book has a wide appeal. I haven't read Tosca Lee's book, but I've heard such great things about it. Your review makes me want to read the book even more. Especially when you noted her style of marrying story and craft. Tosca's writing is nothing short of amazing. I think you'd enjoy the book. Add it to my pile! Thank you so much for reviewing Havah here. I am so glad you've enjoyed it--it makes the tough months of researching and writing it worthile! Thanks for stopping by. Your book was FABULOUS!